Whether planting for profit, sustenance or a bit of both, Monsanto supports every farmer using agriculture to improve their lives. Producing enough food for the rapidly growing global population is one of the greatest challenges facing humankind. Monsanto focuses on providing the necessary technologies, tools and information that empower farmers globally to produce enough food to feed a world population of more than 9 billion people by 2050. Through its commitment to sustainable agriculture, Monsanto pledges to help farmers double their yields in core crops such as maize by 2030 using one-third fewer resources (land, water and energy). With this commitment in mind, Monsanto focuses on helping farmers to maximize yields and manage their risks through high-quality seed, traits and crop protection products. As part of this commitment to customers, Monsanto is involved in various projects with selected partners in South Africa, participating in projects to support farmers by providing products and agronomic support. 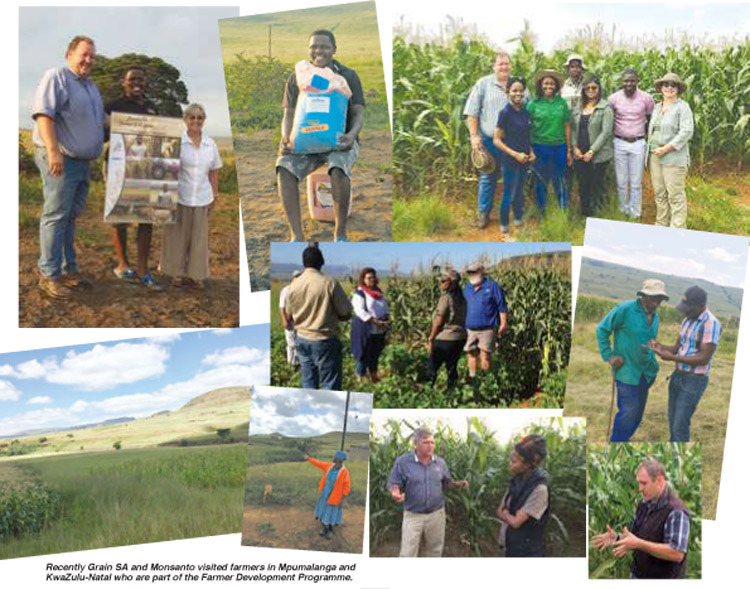 Since 2013 Monsanto has been partnering with Grain SA in their Farmer Development Programme in KwaZulu-Natal, the Free State, Eastern Cape, Mpumalanga and the Eastern Cape, and much has been achieved since the programme started. Monsanto is proud to invest in the Farmer Development Programme of Grain SA.